The Blue Angelfish is a relatively large, attractive angelfish found in the Caribbean. This angelfish is yellowish-tan with areas of bright light blue trim it is quite similar to the Queen angelfish and the two are often mistaken. One of the obvious differences in the coloration of these two fish is that the Queen angelfish will have blue trim on the trailing edges of its upper and lower fins while the Blue Angel fish does not. While the Blue Angelfish is sometimes found in smaller sizes of about 3 inches, it is usually available as a much larger fish. Generally the Blue Angel fish should be kept in aquariums larger than hundred gallons and sometimes much larger depending on the size of a fish. It will lead a wide variety of food including flake food, mussels, and clams. The Blue Angelfish is relatively non-aggressive, however, as with most angelfish it is not considered safe to keep in miniature reef aquariums, as it may attempt to feed on corals. The Blue Angelfish requires a large aquarium of at least 150 gallons with plenty of hiding places. The Blue Angelfish groups up to 15 inches in size. 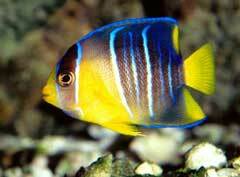 Dwarf Blue Angelfish Are generally available at 2-3 inches. Diet: A varied diet of meaty foods such as vitamin-enriched brine shrimp and finely-chopped crustacean flesh, Spirulina, marine algae, high-quality angelfish preparations, mysid or frozen shrimp, and other meaty items will provide good nutrition. Sexual Differences: Blue Angelfish is hermaphroditic, very difficult to breed in an aquarium, and there are no distinguishing markings that differentiate males from females.